I ABSOLUTELY LOVED RECKLESS. I CAN'T EVEN PUT IT INTO WORDS.THE BOOK WAS SO AMAZINGLY FANTASTIC, I COULDN'T PUT IT DOWN.I have to admit this is one of the best books I've read it a long time. I love the idea, of the fairy tale world. It's different, to the fairy tale modern rewrite craze. 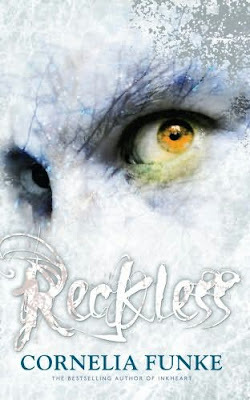 Reckless is an amazing book, and I have already devoured it twice. I can't wait to the next two in the series. Of course I was lucky enough to meet Cornelia Funke and have my first edition signed, and boy am I glad. The book just blew me away. Some people were saying that the book is not for kids as the the characters are adults, but when I went to the reckless tour and listened to Cornelia she clearly stated, 'A lot of people say that if it's a children's book it must have children, but dustfinger was not a child but became one of the best loved characters, so as you will see Jacob and Will are both adults but all the more reason to love them.' Yet again she was so right. The description in the book was amazing, and I felt it got better throughout the book Cornelia has such a unique way of telling a story it's almost as if you're there. Obviously as she was helped by Lionel Wrigam in creating the book, so she has said that in a couple of years time it will become a film. Surprisingly my favorite character was not Jacob, but Fox. She had a nice, funny, quirky personality, who cared deeply about Jacob, and let the Jealousy get the better of her when he drank the Lark's water. Another thing I luurved so much was the illustrations. Cornelia is an amazing artist, and I loved all her illustrations. Unfortunately Cornelia said that not all of the Illustrations were included in the UK edition, unlike the US, German etc., so I would have liked to have seen them but, I guess I should be happy that they included any of her illustrations. The characters were very easy to get to know, and sometimes you would forget that they weren't even real. You befriended them quickly and easily. The dark fairy sounded interesting, and the jade goyle (Will) was cool, but I'm glad he got changed back. I'm seriously hyped to see what happens in the next book, because Jacob is paying with his life. The book overall is a fantastic novel, and should become a modern fairy tale, just as Beastly has. The book is fantastic and definitely five stars.